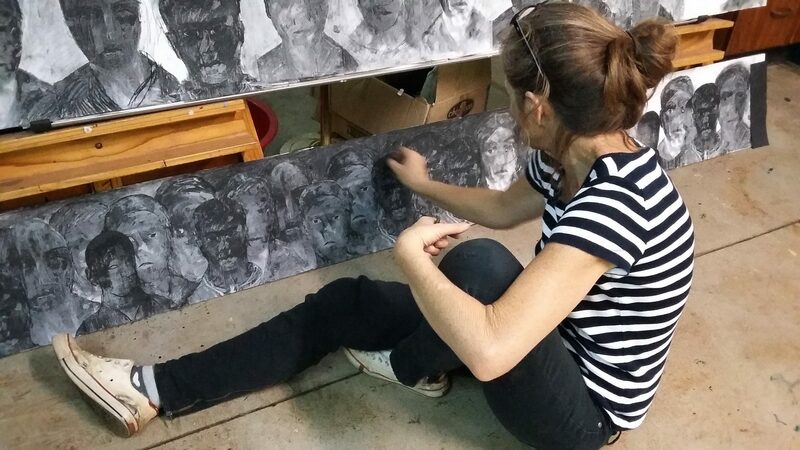 Gill Rosselli is an award-winning Zimbabwean artist whose work is inspired from her upbringing in a country with so much physical beauty yet heartbreaking injustice. After studying Fine Art at the University of Cape Town, Gill returned to her homeland to work as an artist. Her exhibits and installations reflected her preoccupation with the struggles of the country, as well as her fascination with its natural beauty. Fostering a close relationship with the earth, Gill’s pieces are inspired by nature and reflect an empathy with and an appreciation of all things it provides. Land in Zimbabwe represents the economic and political collapse of the nation; it has been a source of wealth, loss, pain and injustice for its people. These are themes Gill has explored in her works. Her ability to capture the poignant struggles of the country is displayed through her latest works in the exhibit Belonging. She loves to work with the earth and soil, creating pieces that are three dimensional and interactive, frequently using the medium of collage to explore the link between art, nature and the environment. Through her years of working as an artist, her focus has not remained on the earth but expanded to include other aspects of the natural world such as water and the element of gold. A much sought after artist with a renowned international reputation, Gill has work in various public collections, including the Mobil Oil Collection, the permanent collection of the National Gallery of Zimbabwe, the Royal Embassy of the Netherlands and private collections in countries the world over, including the UK, Netherlands, Brazil, Sweden, Belgium, South Africa, Austria and Germany.